More often than not, Begonias are grown for their highly decorative and spectacularly ornamental leaves, and for some, their flowers are secondary. I can’t look at this photo and agree with that statement. This is my catch-up entry in Becky’s ‘In the Pink’ Square in September photo challenge because I missed yesterday. 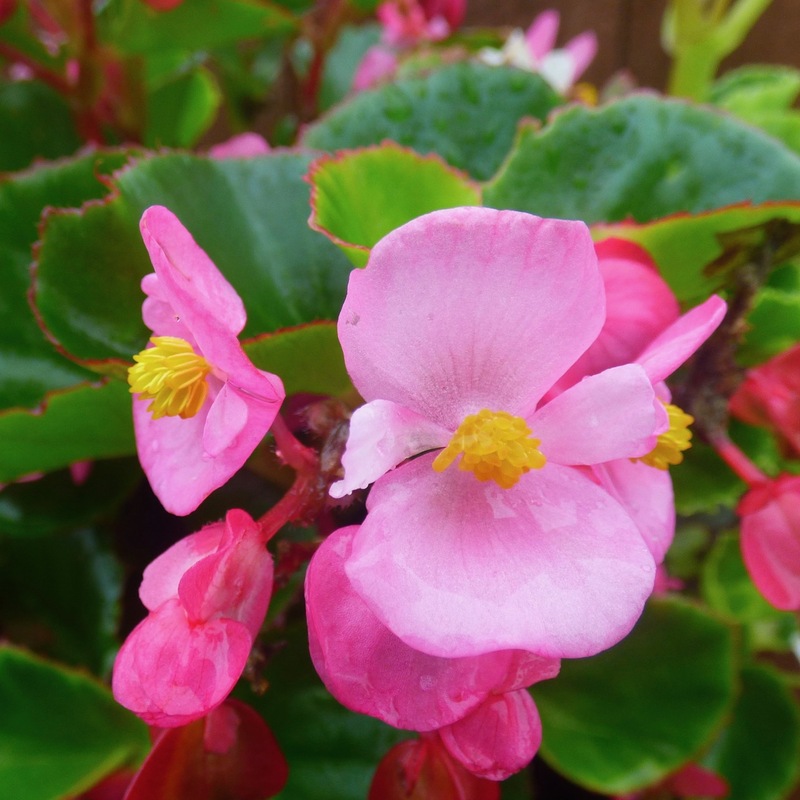 Begonia belongs to the family Begoniaceae and is a flowering perennial. The genus Begonia includes more than 1,300 species and countless hybrids, mutations, and opportune seedlings. Charles Plumier named Begonia in honour of Michel Bégon, a former governor of the French colony of Saint-Domingue. (Today we know this as Haiti). I’ve spoken about Charles Plumier before. He’s the seventeenth-century French botanist ‘Plumeria’ are named in honour of. Semperflorens Often called ‘wax’ or ‘bedding’ begonias, this group is probably the most commonly known in the world and bloom constantly. Canes These are tough Begonias with elongated stems that resemble bamboo and are often called ‘Angel wings’ because of their wing-shaped leaves. Shrubs Whether they are miniature or giant, these bushy, multi-stemmed types are easy to grow. Rhizomatous These Begonias are grown for their showy leaves that make them very popular with collectors. Tuberous Usually grown for their showy flowers, these Begonias come in every colour except blue. Rex* This group is renowned for their magnificent foliage, colour, and texture – flowers are secondary compared to the striking leaves. Trailing-Scandent Typically grown in hanging baskets, this group has telltale glossy leaves and pendulous flowers. Thick-stemmed Not widely grown, these begonias have large fleshy stems and an upright habit. However, there are so many different hybrids that some Begonias have characteristics that can place them into more than one group. The Begonia in my photo is from the semperflorens group, but I also have one or two from the canes group, and (so much for being ‘not widely grown’) I also have one from the thick-stemmed group. Look out for Begonia – Part 2 later today. * Rex begonias are actually a type of rhizomatous begonia. I do try to capture the beauty of the flowers I grow. My friend Coral said “Oh My!’ when she saw the photo. I think there is too Fran.